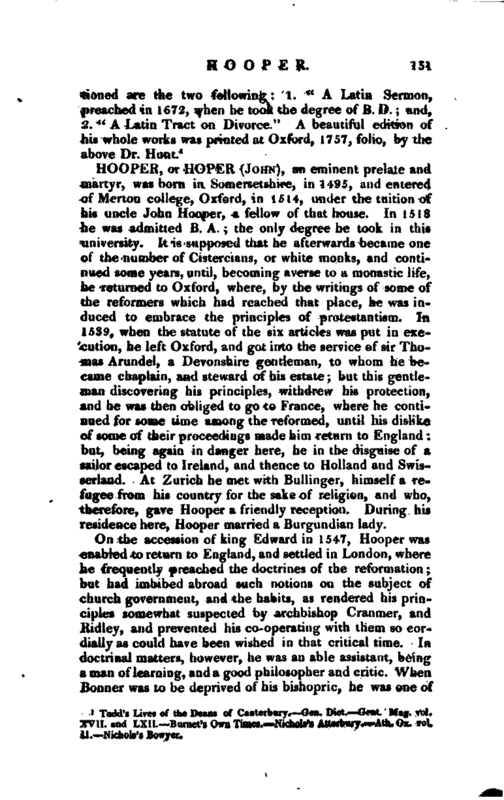 , an eminent prelate and martyr, was horn in Somersetshire, in 1495, and entered of Merton college, Oxford, in 1514, under the tuition of his uncle John Hooper, a fellow of that house. In 1518 he was admitted B. A.; the only degree he took in this university. It is supposed that he afterwards became one of the number of Cistercians, or white monks, and contir nued some years, until, becoming averse to a monastic life, he returned to Oxford, where, by the writings of some of the reformers which had reached that place, he was in-r duced to embrace the principles of protestantism. In. 1539, when the statute of the six articles was put in execution, he left Oxford, and got into the service of sir Thomas Arundel, a Devonshire gentleman, to whom he became chaplain, and steward of his estate; but this gentleman discovering his principles, withdrew his protection, and he was then obliged to go to France, where he conti r nued for some time among the reformed, until his dislike of some of their proceedings made him return to England; but, being again in danger here, he in the disguise of a, sailor escaped to Ireland, and thence to Holland and Swisserland. 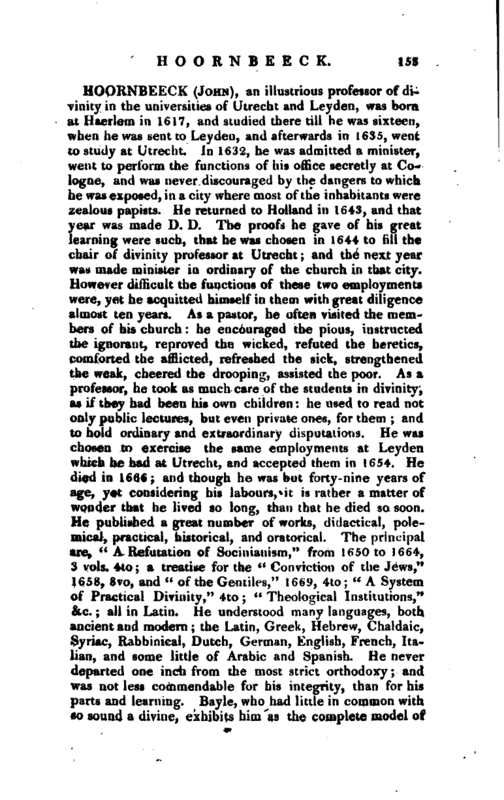 At Zurich be met with Bullinger, himself a refugee from his country for the sake of religion, and who, therefore, gave Hooper a friendly reception. During his residence here, Hooper married a Burgundian lady. 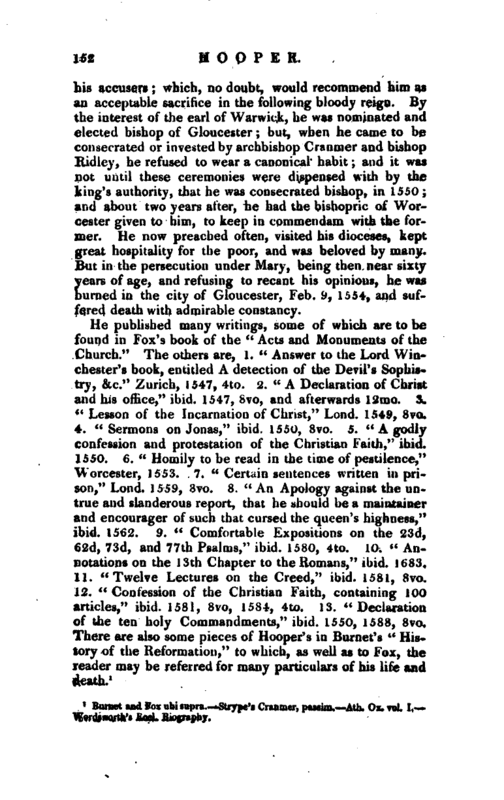 On the accession of king Edwar.d in 1547, Hooper was enabled to return to England, and settled in London, where he frequently preached the doctrines of the reformation; but had imbibed abroad such notions on the subject of church government, and the habits, as rendered his principles somewhat suspected by archbishop Cranmer, and Kidley, and prevented his co-operating with them so cordially as could have been wished in that critical time. In doctrinal matters, however, he was an able assistant, being a man of learning,. and a good philosopher and critic. When Bonner was to be deprived of his bishopric, he was one of | his accusers; which, no doubt, would recommend him as an acceptable sacrifice in the following bloody reign. By the interest of trie earl of Warwick, he was nominated and elected bishop of Gloucester; but, when he came to be consecrated or invested by archbishop Cranmer and bishop Ridley, he refused to wear a canonical habit; and it was not until these ceremonies were dispensed with by the king’s authority, that he was consecrated bishop, in 1550; and about two years after, he had the bishopric of Worcester given to him, to keep in commendam with the former. He now preached often, visited his dioceses, kept great hospitality for the poor, and was beloved by many. But in the persecution under Mary, being then near sixty years of age, and refusing to recant his opinions, he was burned in the city of Gloucester, Feb. 9, 1554, and suffered death with admirable constancy. 1 Burnet and Few ubi supra. Strypt’s Cranmer, passim. —Ath. Ox. vol. I. Wordsworth’s Eccl. Biography.